(1.1) By confirming your order on this website you accept these terms and conditions. (2.1) We are able to offer delivery to all addresses in England, Wales and the Scottish mainland from Aberdeen southwards. Delivery costs are extremely high in other areas; therefore, we cannot deliver elsewhere. (2.2) Currently, we do not offer shipping overseas. (2.3) The following appplies to postcode areas BB0-BB7, BB18, PR & FY. 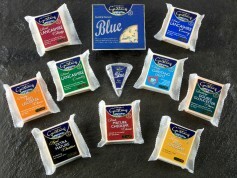 For orders over £80.00 delivery via 24 hour courier is free of charge. Purchases under £80.00 will incur a £6.95 delivery cost. This is to cover the cost of shipping and the cost of packaging. (2.4) For orders over £100.00 delivery via 24 hour courier is free of charge. Purchases under £100.00 will incur a £10.00 delivery cost. This is to cover the cost of shipping and the cost of packaging. (2.5) Local deliveries to the BB8-BB12 areas are free of charge subject to the stated minimum spend. (2.6) Orders can be collected in store free of charge. Orders not collected within 48 hours of the order being available for collection will be disposed of and the order deemed complete. No refunds can be given for uncollected orders. (2.7) Delivery days will be confirmed via email shortly after receipt of an order. Our delivery schedule is shown on our Delivery Page. (2.8) It is the customer's responsibility to check that they have chosen their preferred delivery date and method during the checkout process. We cannot take responsibility for errors made during the checkout process. We suggest that customers double check ALL of their order details before finalising their order. (2.9) When placing an order, customers are asked to provide special delivery instructions for the courier. These instructions will tell the courier where to place the delivery should the customer not be available to accept the delivery in person. If these instructions are provided and our courier cannot obtain a signature to confirm the delivery of the order, it will be left at the customer's own risk. We accept no liability for its loss or damage. (2.10) The customer is responsible for providing a full and correct address for all deliveries, including but not limited to the postcode. If our carriers are unable to deliver any order due to any error in the address, the customer will be charged for the order in full. (2.11) We cannot accept returns or issue refunds for products that the courier has been unable to deliver. (2.12) National deliveries via courier will be made between the hours of 8.00am and 5.00pm. (2.13) Local deliveries will be made between 5.00pm and 7.00pm. (2.14) We always aim to deliver goods within the delivery slot agreed. However, we cannot accept liability for any costs, losses, damages or expenses incurred by the customer or any third party if we deliver the goods outside of this slot or don't deliver all or any of the goods in the order. (2.15) Delivery costs and minimum spends are subject to change. (3.1) Our packaging uses a temperature controlled system so that ensures that its contents are kept below 5oc for 48 hours. (3.2) All raw meat cuts are delivered vacuum packed for freshness; unless otherwise stated on the website. (3.3) From time to time, the packaging that we use can become punctured/damaged during transit. We regret that we are unable to accept claims for damaged packaging unless it has caused the contents to become damaged or unfit to consume. (3.4) Marinated cuts and meats in sauces are delivered in foil trays with lids. These are wrapped in food safe plastic bags to prevent leakages. (4.1) All products are labelled with their description. 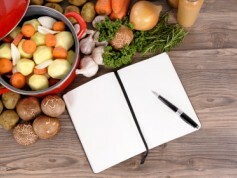 (5.1) Orders placed are for nominal weights of produce at specific prices. Our aim is to provide meat weighing as close to the weight ordered as possible. (5.2) Orders will always meet the minimum weight or be over the minimum weight at no additional cost to the customer. (5.3) Orders placed over the phone or by email and not paid for via the online system will be weighed and charged accordingly; unless online prices and weights or special offers are quoted. (6.1) In the unlikely event that we are unable to meet an order, we will contact the customer by telephone or by email as soon as possible. A full refund will be issued. (6.2) If we are unable to meet part of a small order (small selection of items), we will contact the customer as soon as possible. The customer will be offered a substitute product to the same value. Alternatively, the customer can accept a full refund. (6.3) If we are unable to meet part of a large order (large selection of items), we reserve the right to substitute that part of the order for a similar product of the same or superior quality, to the same value. (6.4) In the event that we are unable to dispatch an order due to inclement weather, we will contact the customer by telephone or by email as soon as possible. A full refund will be issued. (7.1) When orders for items such as half lambs, whole lambs and half pigs are placed, there may be some variation in the cuts supplied. However, the weight of the product as a whole will always meet the minimum weight stated at the point of order. (8.1) If for any reason the customer is dissatisfied with the products that they have received, they should contact our shop within 24 hours of receipt. (8.2) All complaints will be dealt with personally and immediately by Ryan Moffat, who is the proprietor and head butcher. He will undertake to resolve all complaints to the customers satisfaction within 7 days. (8.3) With the exception of faulty goods, we regret that we are not able to accept returned goods for refund or exchange, due to their perishable nature. (8.4) Where a claim of defect or damage is made, the goods may have to be returned by the customer to us within the best before date or use by date. The customer shall be entitled to a full refund plus any return postal charges if the goods are in fact defective and/or need to be returned. (8.5) Statutory rights are not affected. (9.1) In the event of an order failing to arrive when expected, customers should contact us by telephone or email by 5.30pm on the expected delivery date. The issue will be investigated immediately and the customer will be informed of the situation. 9.2 We always aim to deliver goods within the delivery slot agreed. However, we cannot accept liability if we deliver the goods outside of this slot or don't deliver all or any of the goods in the order. (9.3) Should any order not be delivered within one working day of the date given in the order acknowledgement, the customer will be entitled to a full and immediate refund. 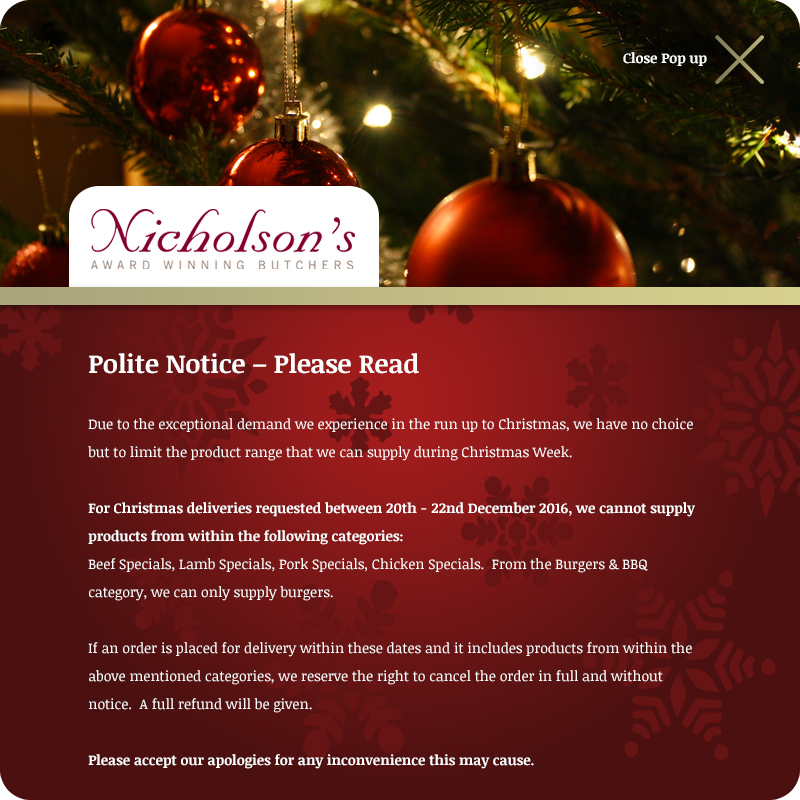 (10.1) We regret that due to the preparation involved, orders for Multi Bird Roasts, Whole Turkeys, Buffet in a Box products and Christmas orders (orders to be collected/delivered during Christmas Week) cannot be cancelled once ordered. (10.2) All orders for goods (excluding those goods as detailed above) must be cancelled at least 5 working days prior to the date of dispatch. (10.3) We reserve the right to pass on the 3.4% charge by our payment gateway to the customer. (11.1) All personal data collected from customers will be held securely, in confidence, and never disclosed to any third party without your express permission. (12.1) If an Early Bird product is purchased and the customer does not select a delivery date that falls on/before 14th December 2018, we will endeavour to contact the customer via email. The customer can then choose to pay the outstanding balance, or choose to have their order dispatched on Thursday, 13th December 2018 for delivery on Friday, 14th December 2018. The order would be delivered in its entirety. (12.2) If we are unable to contact the customer via email, their order will be cancelled and refunded in full. (12.3) It is the customers responsibility to select their preferred delivery date during the checkout process. (12.4) By placing an order for Christmas goods, the customer confirms that s/he has read our Christmas Information page in full.